The evolution of digital media technology is powered by the generational shift from Boomers to Millennials. This has totally disrupted the traditional fundamentals of how brands and marketers reach their audiences, and has business leaders facing unprecedented challenges in managing and growing their organizations. 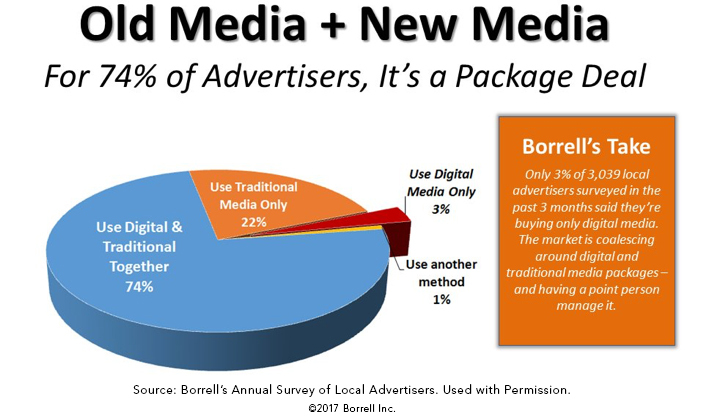 On Brand is addressing these local audience and advertiser challenges through ownership of the #1 reach media, broadcast radio, paired with the highly-effective targeting and call-to-action capability of digital marketing. The evidence has been clear for some time…advertisers prefer a combination of Traditional and Digital Media channels to gain maximum Return on Marketing Investment. With 92% of adults in the U.S. using radio each week (Nielsen 2018 Total Audience Report), and the rapid adoption of digital media consumption by those same adults, On Brand Media is perfectly positioned to serve both today’s and tomorrow’s audiences and advertising requirements. The Restaurant Consulting practice may now be found at our Hospitality division, Liebeck Morris. Click Here to learn more. Hall of Fame football coach Bill Parcells is famous for saying, “You are what you record says you are.” On Brand takes that statement seriously, and applies that focus to all of our client relationships. Allow us to share just a few of the results we have helped produce for clients. 20 year old concept with eroding sales over 5 year period. Designed and executed research project to ascertain guest perceptions. Designed and managed focus group to test optional strategies. Designed and managed integrated marketing plan to communicate brand’s move from traditional casual dining menu to farm-to-table menu strategy. Designed overall brand strategy and aligned operations with marketing. 75-unit concept spread across 10 states with single locations in numerous small markets and clustered operations in several larger markets. With total marketing budget of 1.2% of net sales annually the challenge was to impact traffic and sales across all units. On Brand researched each location and developed a suite of tactics including broadcast and zoned cable television, e-mail, digital marketing and support POP to communicate a highly focused, simple brand message with strong call to action. 5 year old concept recently acquired by large private equity restaurant brand owner. Engaged On Brand to determine how to grow a beer-only concept. Designed and executed research project to ascertain guest perceptions. Conducted in-person site observation and general market data to determine options. Recommended concept pursue select food menu and highly targeted expansion of alcohol concept to maintain high-end demographic appeal. 400+ unit retail chain showing flat to slightly negative sales comps. Current “spend to volume” approach to marketing dollar allocation no longer viable. On Brand partner created marketing prioritization model to quantify relative health of each market. Key factors assimilated and weighted into an “Opportunity Index”, leading to future marketing budget allocation based on the Opportunity Index score ranking. Global company facing challenge of growing a niche cooking product. Household penetration low due to seasonality and modest marketing budget support. Low annual sales made aggressive national consumer media effort impossible to justify. On Brand partner recommended 3-year plan including highly-targeted, low cost national print supported by three-pronged plan of regional broadcast media to drive awareness, trial and sustained usage during off-season periods. 30+ locations in and around suburbs but not within the major market nearby. Sales insufficient to support use of local TV, radio or newspapers. On Brand conducted research to determine current brand image, operating strengths and weaknesses as well as customer profile and usage patterns. Designed integrated marketing campaign using digital platforms and direct mail to target communications to “Best Customer” in trade areas to avoid expense of major market media. John Gehron is chairman of On Brand Media and has had a legendary radio career as a programmer and executive in America’s largest markets and with the country’s premier media companies. He began in Philadelphia as Program Director of CBS’s WCAU-FM (now WOGL), the first major market radio station to try the oldies format. That success led to being transferred to WCBS-FM in New York to start their oldies format in 1972. In Chicago, Gehron spent 13 years in the 70s and 80s as Program Director and later General Manager of WLS. He re-joined CBS Radio to be General Manager of WODS in Boston, then returned to Chicago with Pyramid Broadcasting as Vice President and General Manager of WNUA-FM. There he created a national standard for the “smooth jazz” format that became a major factor in the nation’s third largest radio market. In 2001 John was Regional Vice President and Market Manager for Clear Channel Chicago’s seven stations as well as handling the surrounding region including Madison, Milwaukee and Eau Claire, Wisconsin. In 2006 he became General Manager of the newly formed Harpo Radio to build the XM satellite channel “Oprah and Friends”. Gehron currently serves as Chairman of AccuRadio, one of the leading Internet Radio companies, previously serving as their COO. Chris Petersen is a longtime senior executive in media, marketing services, broadband services and brand development companies. Prior to founding On Brand Management & Media, Inc. in early 2013, he served as President & CEO of Brandstand Group, a national chain restaurant brand development firm. He was President & CEO of broadband services (cable) provider Prime Time Broadband, Senior Vice President for Space Media at aerospace company SPACEHAB, President & CEO at PR services firm NewsUSA, President of the NSE Radio Network, General Manager of radio station and newspaper owner Lakes Country Communications and Producer of Space Shuttle Television at NASA’s Johnson Space Center. Petersen started his career in radio in Western New York before moving to Houston, where he served as a news anchor for KTRH-AM and worked at KPRC-AM, KYST, KBTL and KRBE in various on-air capacities. He also was a sportscaster for KHOU-TV in Houston. He served as a Producer of Space Shuttle Television at NASA’s Johnson Space Center in Houston. Petersen has served in senior management of both publicly-held and privately-owned companies. He has designed and executed multiple successful strategic plans for businesses he has led as well as for clients, including turnarounds, recruited and developed leadership teams, driven rapid sales and profit increases, and managing to regulatory compliance. Bill Zaccheo has more than 25 years of senior management experience with global media companies where he has been responsible for all critical operating divisions. He works with On Brand clients on digital/traditional media and marketing strategy and supporting various marketing functions. Bill has gained a broad-reaching and in-depth knowledge of business development, operations, marketing, programming, sales and general management for both start-ups and established enterprises. He has supplemented his corporate experience through a broad range of high level consulting projects in today’s explosive digital environment; the combination of which uniquely positions him at the forefront of today’s media sector as both a visionary and a seasoned executive. Throughout his career, Bill has been at the cutting edge of new content and delivery systems. He championed one of the first efforts to stream video, both live and on-demand, via the Internet in 1998 with the multi-award winning ComedyNet.com. He was Senior Executive on the founding management team that created and launched E! Entertainment Television, the team that launched the NFL on ESPN, and the early rollouts of HBO and Cinemax. His efforts helped propel each network to become the marquee brands that they are today. Most recently Bill Co-Founded and was CEO of WebVet, LLC a leading provider of news and information promoting the health and well-being of pets. WebVet is the first site of its kind to offer only ‘vet approved’ information to pet owners. With this strategy it was able to secure first ever relationships with the American Animal Hospital Association, Zoetis (formerly Pfizer Animal Health) and Elsevier. He remains on the company’s Board. Gabe Hobbs is a nationally recognized and highly regarded media executive with proven success at both the local and national levels. His deep knowledge of media and emerging digital media platforms uniquely qualifies him to assess content and then develop that content for deployment across multiple media channels, and he is legendary for his ability to help media executives understand the media trends and to adjust accordingly. From 1998 through 2008 Gabe was responsible for the programming oversight of Clear Channel’s 275 news, talk and sports stations. He also served as the in-house consultant for the Rush Limbaugh Program, the Glenn Beck Show, Trumped with Donald Trump, Costas on the Radio with Bob Costas, the Dr. Laura Program, and Jason Lewis. Gabe also worked on the launch of Fox Sports Radio in 2000 and remained an advisor to the network for eight years. Gabe has been nominated by his peers eight times and voted by his peers four times as the News/Talk Executive of the Year during his long management career in media. These awards are presented annually by Radio and Records Magazine. Radio Ink Magazine named Gabe one of the top 10 corporate radio programmers in America. He also served on the Associated Press Board of Advisors from 2000 until 2008. Manuel Solis offers a business lifetime of sales and marketing expertise for On Brand Media clients. His 20 years of career success are based on developing unique options to maximize business opportunities. As a strategic thinker, he has developed extensive experience in creating effective advertising, marketing, and trade show strategies that clearly communicate brand value to consumer markets and healthcare professionals. Manuel served as US and Global Marketing manager for innovative eyewear company Transitions Optical and was instrumental in driving their growth into a multi-billion-dollar brand. During his tenure at Transitions, his Multicultural campaigns won national awards for creativity and effectiveness. He managed overall advertising and public relations agency relationships. Manuel also serves as Partner, Marketing for Liebeck Morris, a restaurant and conference planning consulting firm, and previously was Managing Director of The Alternative Board in St. Petersburg, FL. That firm offers a collaborative business network environment including business and executive coaching, management consulting and advisory board development for local growth businesses. Bubba to those who know him is a 20+ year marketing and advertising veteran. He has been involved in many core brand and new product efforts, integrated marketing communication initiatives and media buying along with consumer research, analytics and strategic/tactical planning. He also spearheads major projects for clients to insure execution of the strategic and tactical planning. Bubba has done ‎extensive work with blue chip clients like Reynolds Metals, AT&T, BB&T Financial Services, Schwan’s ‎Bakeries, Kimberly Clark and McCormick Spices, among many others. He also enjoyed stints at BBDO, ‎Ogilvy & Mather and most recently Media Solutions, where he led the Client Services/Strategic Planning team. He believes today’s evolving ‎media landscape requires an up-to-date understanding of how consumers embrace and interact with both ‎traditional and emerging digital media offerings, and applies that thinking as a foundation of all client strategy and tactical recommendations. Joyce Hess has 30 years of experience in the media business and has an extensive background in categories including retail, restaurants, grocery, broadcast media, automotive, cellular, healthcare, and soft drinks among others. She has supervised advertising spends approaching $250 million annually but also focuses on precise local market targeting via digital and traditional marketing channels. She works closely with digital partners to develop comprehensive plans to reach Millennials, Gen X and Boomer market targets. Some of her current and past client relationships include RaceTrac Convenience Stores, Kauffman Tire, Domino’s Pizza, Popeye’s Fried Chicken, Longhorn Steakhouse, Food Lion, The Home Depot, Randstad, AirTouch Cellular and Beau Rivage/Mirage Resort. While founding and operating her own media planning & buying service, her previous experience as a Media Director/Buyer included positions with Initiative Media, Fitzgerald and Company, Ogilvy & mather and McCann-Erickson. Joyce holds a Bachelor of Science degree in Communications from Middle Tennessee State University.